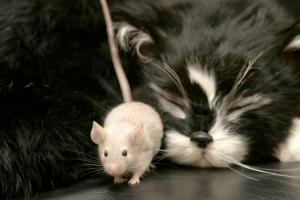 It can be difficult to know what to do when your cat brings in a mouse, bird, chipmunk, or other small animal. After all, your kitty is trying to give you a gift, but it can be hard to know how to politely accept this favor while still disposing of the poor, unlucky creature. Understanding the gifting behavior and its purpose is a good starting point. When a cat doesn't have kittens, you become a member of their family, and therefore they want to bring some food for you. Although you won't eat the gift, it goes back to the instinct of taking care of their own, so they hunt for you because you don't hunt. What your cat brings home can vary widely, depending on where you live. If you live in an apartment, the cat may catch the flies or bugs he sees inside the apartment. If you live in a house in a city, the cat might bring you a grasshopper or a spider from the yard. If you are in the country, you can see many varied things like bugs, rodents and even snakes. The most important thing to remember is why your pet is doing this. He has accepted you as a member of his family and is treating you as such. The cat is trying to prove that he is a great hunter, and he loves you so much that he wants to share what he has caught with you. For your cat, this is the ultimate devotion they can show a fellow creature. The very last thing you want to do, is scream and yell at them, although that may be what your instinct is. Trust me, your cat won't understand why you are so upset or that his behavior is a problem. Try to remain calm and not make a horrified face because cats can read body language. Thank your feline friend for the gift, and if he will let you, dispose of it. If the cat won't let you dispose of his gift, try to get him to take it outside. If the cat won't drop her prey, you can offer her an alternative. Try a special toy, catnip or a homemade treat. If there is another person around, you can try to distract the cat with the alternative gift, and have the other person remove Kitty's hunting prize while the cat is not looking. When disposing of the mouse, or whatever she has brought you, don't bury it, because your cat will just dig it up again. Try to dispose of it in an outside garbage can with a tight fitting lid. The only way to keep your cat from bringing home gifts is to keep him inside all the time. However, don't kid yourself, cats can find mice inside a house too; they can also make you crazy if they want to go outside and you won't let them. So, try not to stifle the natural instinct, and when your cat brings you a gift, try to accept it graciously. Praise him and tell him what a "good kitty" he is.